BTS’ V goes live with "Yeontan"
BTS member Kim Tae-hyung, aka V, aired a V Live broadcast early Thursday morning, with his pet dog, Yeontan. “Sorry that I turned the V app this late. My dance practice lasted longer than I had expected,” he said, wearing red training pants that matched his dyed hair. He said he had asked the group’s fan club to wait up for the livestream. During the 27 minutes on air, he played with the male Pomeranian, occasionally trying to get the pet to show some basic dog tricks, such as sitting down on command and fetching a ball, while communicating with fans. “He’s intimidated by the camera,” V said, as the puppy started barking at the camera. 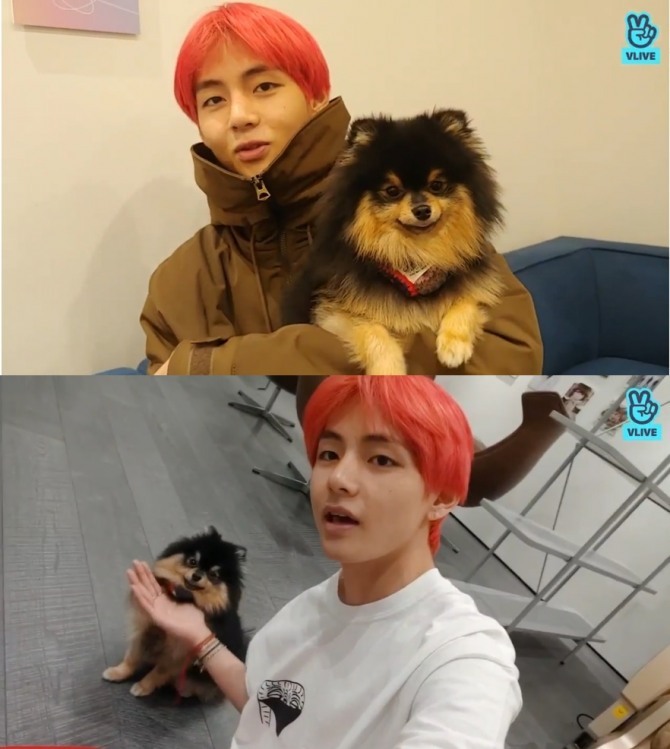 When V is away, touring overseas for instance, Tannie stays at his parents’ place, the singer said. At midnight Wednesday, EXO dropped the first teaser for the upcoming “Love Shot” via its official V Live channel, which features the members with guns and roses. The 25-second clip includes some dramatic scenes in which the bandmates point pistols at one another and engage in a standoff with a group of masked gunmen. Due out on Dec. 13, “Love Shot” is the title track of the band’s album. A repackaged version of its fifth studio album, “Don’t Mess Up My Tempo,” the record will contain 15 tracks, including four new ones. K-pop girl group Red Velvet dropped a behind-the-scenes video from its “RBB” music video filming via V Live on Wednesday. Titled “Hidden Film_Red Velvet ‘RBB (Really Bad Boy),’” the four-minute clip captures the five members of the group on a Halloween-themed set, playing with gothic props. “It’s the second day of filming,” Irene said, trying to make the number two with a skeleton hand. Off the act’s fifth EP of the same title, “RBB” is a rhythm-and-blues pop-dance track with a catchy hook “He’s a really bad boy.” The music video features the bandmates being haunted by a werewolf.